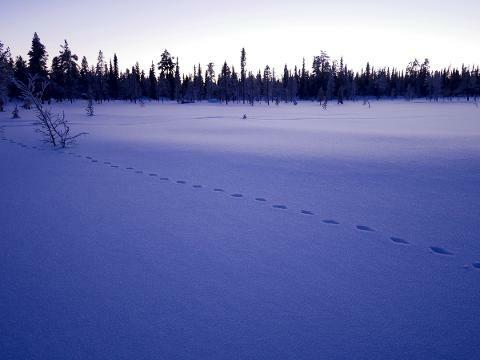 Join us for an adventurous week watching for Lynx in Swedish Lapland. 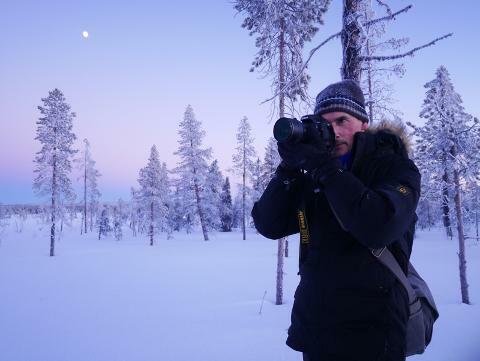 Seach for Lynx in Swedish Lapland with other nature loving travelers on this amazing seven-day trip. These elusive animals are very difficult to find when you need them. 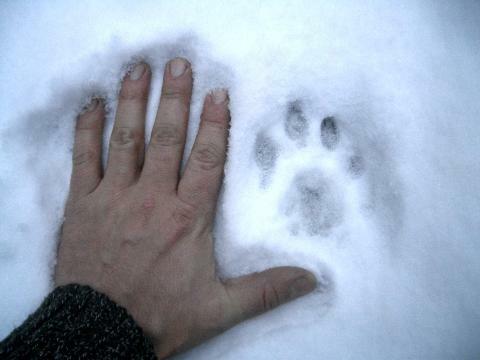 But many of our earlier guests have requested tours where there is a chance to watch for lynx. Even if our guides and some lucky guests get to see lynx once in a while, I must say they are not easy to find on demand. That's why we have chosen to not offer lynx tours. I've talked to many people across Sweden. 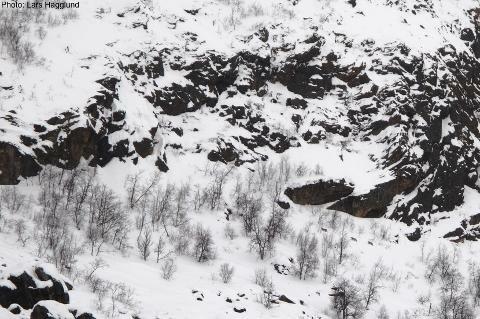 Trackers, Sámi reindeer herders and nature photographers. I've received some very valuable tips. 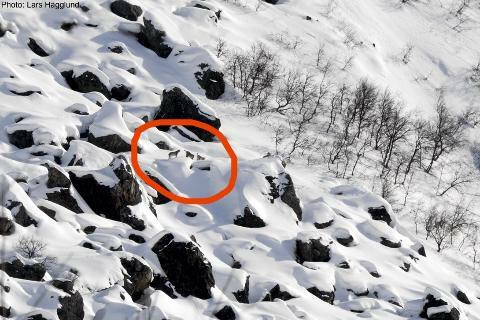 And there are actually a few specific places where there is a chance to see Lynx. One of them more promising than the others. I have finally chosen a promising location. 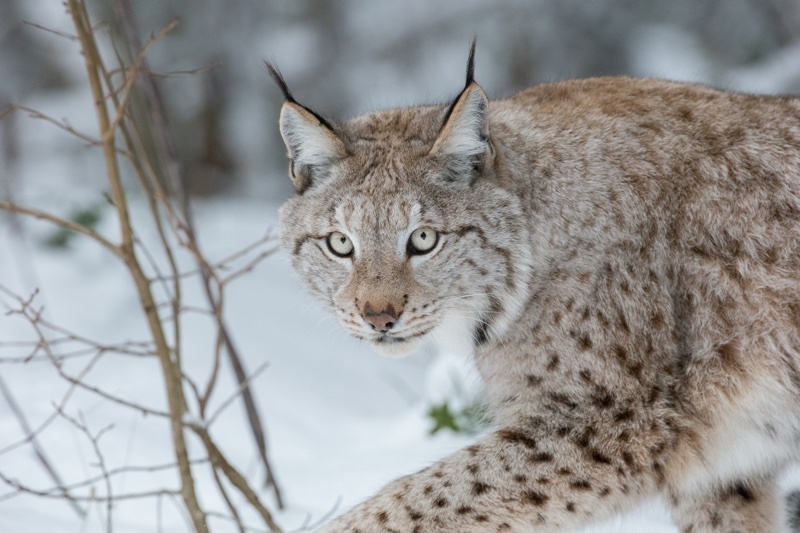 Where the chance to see a Lynx may be better than anywhere else in Sweden. I've promised not to reveal the exact location so I can't tell you where we are going until you arrive. We are now planning for our first tryout trip, scheduled for March 2019. March means mating season for Lynx, which makes it even more interesting. That's the only time of year when they make calls. So that you can hear if they are nearby. The location is not easy to reach. 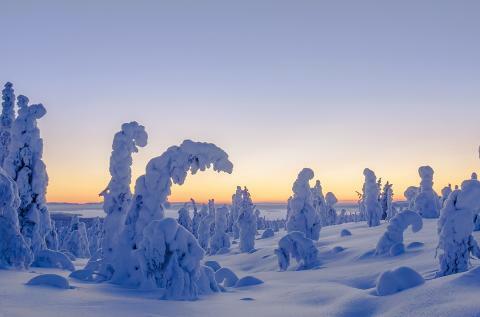 It is a valley in the North-Western parts of Swedish Lapland. With no roads leading there. 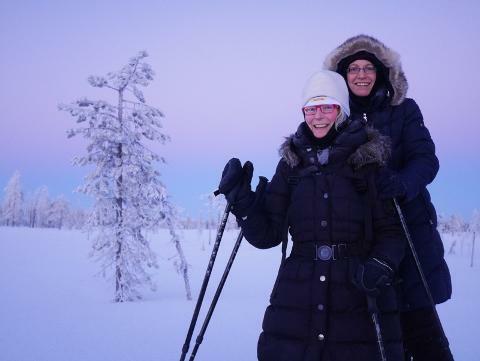 You will arrive at Luleå airport or by an overnight train from Stockholm to Jokkmokk, then drive by car for a few hours, then go with snowmobile for another couple of hours, and finally go on nordic skis the last bit. We will finally reach a fantastic little mountain cabin where we will spend some days together. We will even cook our meals together. In daytime we will search for tracks and watch for Lynx through binoculars and spottig scopes, and with a bit of luck we can spot Lynx on the rocky hillside in the distance. At night we will hope for another sought after view, the Northern Lights, a common sight in this area. 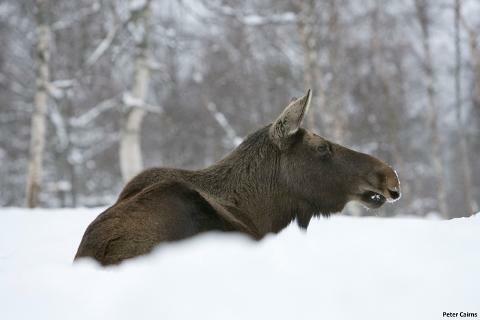 March in Swedish Lapland also means you have a good chance to see other impressive wildlife. 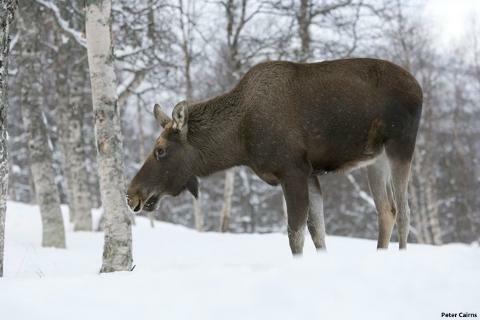 This part of Sweden is home to large populations of reindeer, as well as good numbers of moose. We also have the chance to see Mountain hare and Ptarmigan. Our guides will ensure nothing is missed as we explore this beautiful landscape. Each day we will explore the valley on nordic skis slowly in a small group, keeping an eye out for the tracks and signs of these felines, hoping for a sighting. Even if we’re not lucky with lynx, the location in itself is stunning and just being out there is an adventure. Will we see any Lynx? We can't promise that, but we will certainly try our best. And many people have seen Lynx at this exact place. Reindeer herders talk about it, researchers and wildlife experts have done Lynx research here, and journalists have been here to see Lynx. But of course, most of the time you don't see it. They avoid people and are well camouflaged. 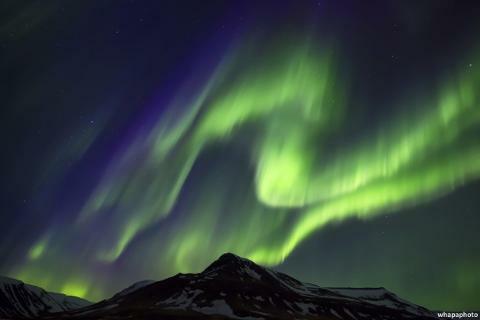 Will we see the Northern Lights? We can't promise but ut is very likely. 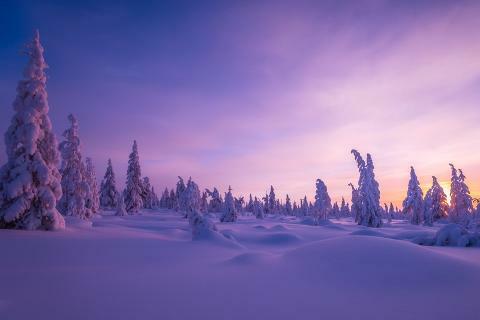 Swedish Lapland offer more stable weather than other popular winter destinations which means we have the best conditions. 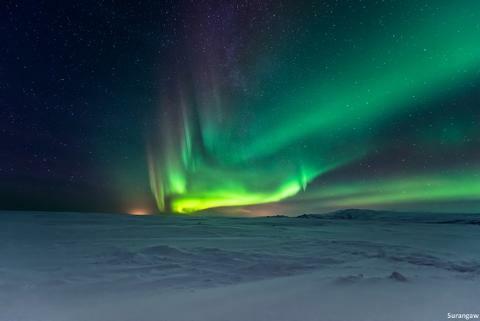 Imagine yourself standing in deep snow under a green explosion of Northern Lights far out in the wild. Take the night train from Stockholm to Jokkmokk. Or fly via Stockholm to Luleå and take the transfer bus from Luleå to Jokkmokk. We all meet up in Jokkmokk in the afternoon. Welcome dinner with your tour guide and fellow travelers. 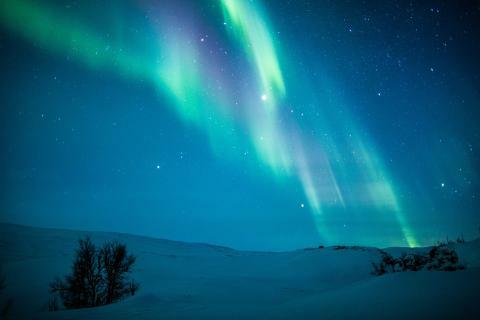 Each evening holds an opportunity to watch for Northern lights. If the sky is clear, we all go outside to look out for the aurora. Of course, since the Northern lights are a natural phenomenon, we are never guaranteed to see them, but Northern Sweden has some of the most frequent and intense auroral activity on the planet...meaning our odds are very good. Big adventure day! On this day we will drive by minibus, then go on a snowmobile sledge, and finally go the last bit on nordic skis. Along the way we will hopefully see some moose and reindeer. We will reach our cabin in the late afternoon. As we get to the cabin we watch for Lynx, and later for the Northern Lights. 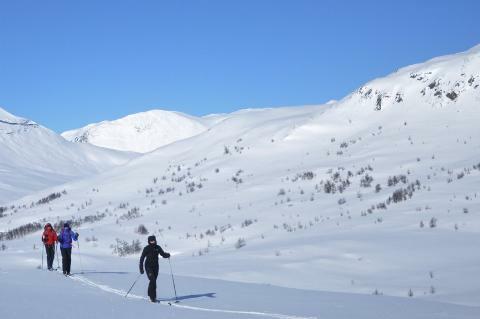 During these two days we will spend our days watching through spotting scopes, but also explore the valley on skis. 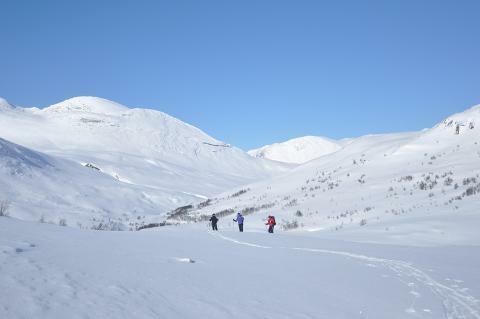 To search for tracks and signs of Lynx and other wildlife. We cook together, watch for Northern Lights each evening and stay in the cabin at night. We leave the cabin behind and start our journey back to Jokkmokk. 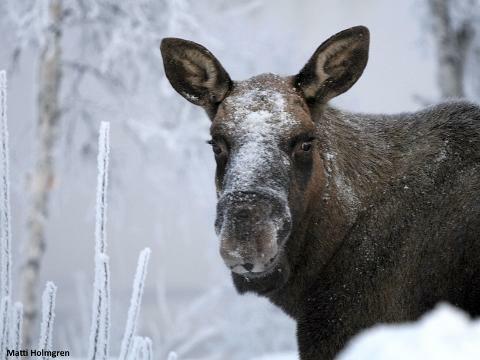 This gives us another good chance to see more moose and reindeer. After breakfast you can take the bus back to the train station or to Luleå airport. Single room supplement 400 SEK for the first and last night. Special transfer from Luleå airport with return SEK 1500. Note that there is also an option to use the public airport shuttle transfers. 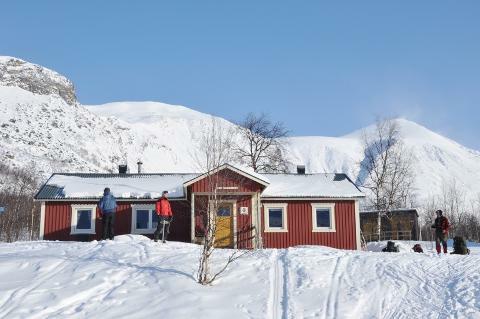 Two nights in single/double/twin rooms at Jokkmokk guesthouse. The rooms are basic but comfortable and clean, all with shared bathroom in the corridor. Three nights in shared mountain cabin. The cabin has plenty of beds and sees few visitors at this time of year, but it is open for anyone so technically we are not able to promise that you will sleep in a proper bed. If we are unlucky some of us may have to sleep on a mattress on the floor and if you are a couple you may have to share a bed. Bathrooms are shared in a separate shed. There is no electricity and no showers. There is a kitchen with wood heated stoves. We need you to participate in the cooking, and to help carry water and fire wood. We will put a lot of effort into preparing the menu for this tour. A typical day starts with a Swedish breakfast and in the evening, we cook dinner together in the cabin. As long as weather permits we will have lunch outside to fully enjoy the landscape around us. 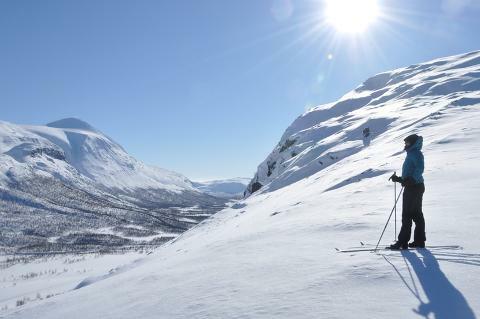 If you are looking for a longer holiday we recommend you to add extra nights in Jokkmokk or Luleå. Recommended minimum age is 15 years. Participants should be able to walk in uneven terrain without difficulties. Walking level is medium. You don't need any previous experience in skiing but you need to be generally fit. 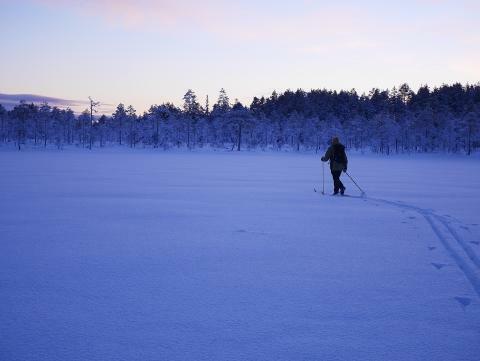 Nordic skiing is more like walking on skis and you will see that it is easy to learn. 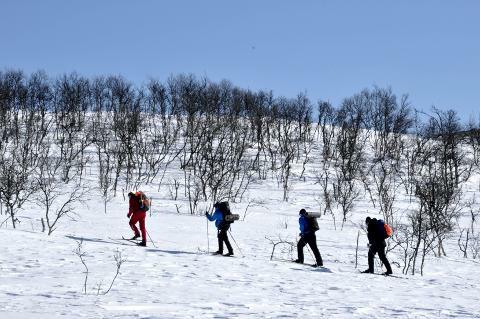 We will be skiing between 5-10 kilometers per day in terrain with just little differences in altitude and with a daypack of around 5 kg. All skiing is optional. You can also stay by the cabin and spend more time watching for Lynx. Maximum 7 participants with one guide. With two guides we may take up to 12 participants. Meet us at Jokkmokk guesthouse at 3 pm. On the last day there is a bus that will take you to the train station for the overnight train to Stockholm, or an airport shuttle car that will take you to Luleå, even for the early morning flight if you want to leave early. TRAIN: Take the Arctic Circle train from Stockholm or Arlanda airport to Murjek and then the connecting bus to Jokkmokk, on the same ticket. When you arrive in Luleå you just walk 200 meters to Jokkmokk guesthouse which is where we meet up. The train ride is about 13 hours and you can choose to travel in daytime or overnight. This may sound like a long way to travel, but it is a great trip and a good start of your adventure. Train travel is also much better for the environment. The train has a restaurant with basic meals, snacks and drinks. If you are unsure you can travel by train in one direction and fly in the other direction. Purchase your train tickets at www.sj.se, everything is done online. The cost of the train ticket depends on which comfort you choose. For example, the rate for a bunk bed in a shared 6-bed room is about 2500 SEK for a return ticket. 3-bed rooms or private rooms are also available. Let me know if you need any advise. Note that the tickets for these trains are released about 3 months prior to departure. BY AIR: Fly from Stockholm to Luleå Airport (LLA), take the airport shuttle car to Jokkmokk. Our booking procedure is simple. Just pick a date, fill in the form and off you go. You pay 10% now and the rest 45 days before you arrive. We manually review your booking to make sure that we still have availability. If everything is okay we will send you a confirmation by email within 24 hours. Until your booking is confirmed no payment or charges will be applied, and credit card details are held for security purposes only.